The glassy, somewhat dark exterior of Pepperdine’s Weisman Museum can seem uninviting. Upon first glance at the large concrete building, some students might think it is closed. But open the door and go into the museum and you find yourself in a much different realm — bright, lively and teeming with color. Michael Zakian, director of the Weisman Museum, recently introduced a new initiative — “Wellness in the Weisman” — aimed at making the university’s museum a place of community healing and a channel for connecting with students. Zakian said he first became aware of using the museum as a wellness space last year when there were articles circulating about other institutions using their museums as places of wellness. 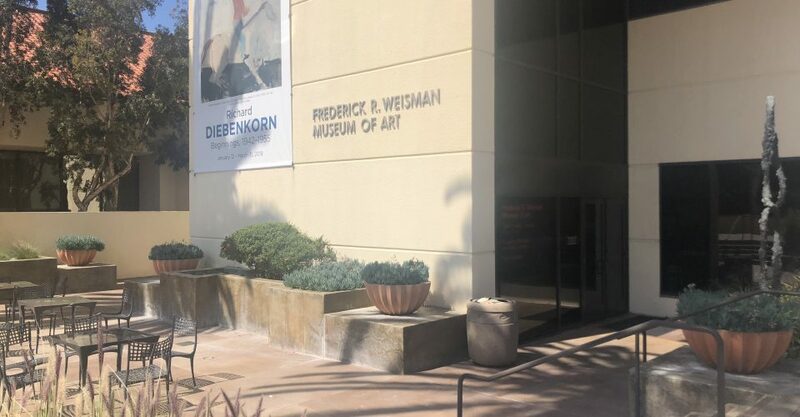 When Zakian began researching and gathering materials about other museums with similar programs, he thought the idea might have some traction at Pepperdine. 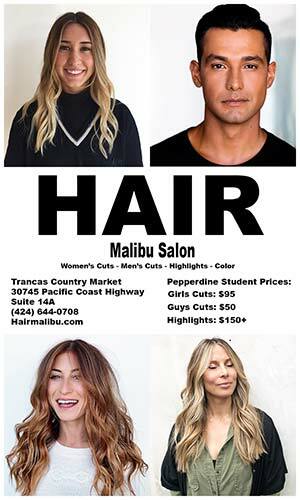 Zakian said there weren’t many models to choose from and of the museums that did have these wellness programs, they were primarily targeted toward the elderly, which was not germane to Pepperdine. An offshoot of this idea of wellness in museums is the recent trend of using museums as places of fitness. In 2017, The New York Times ran an article about a mindfulness session at the Rubin Museum of Art and a host of other museums offering fitness, meditation and yoga classes. This trend raises the question of whether viewers are engaging with the art or simply using the space alongside the art. For the Weisman Museum, art is at the very center of the wellness initiative. After researching the topic, Zakian met with Connie Horton, vice president for Student Affairs and former head of the Counseling Center, who gave her full support for the initiative. 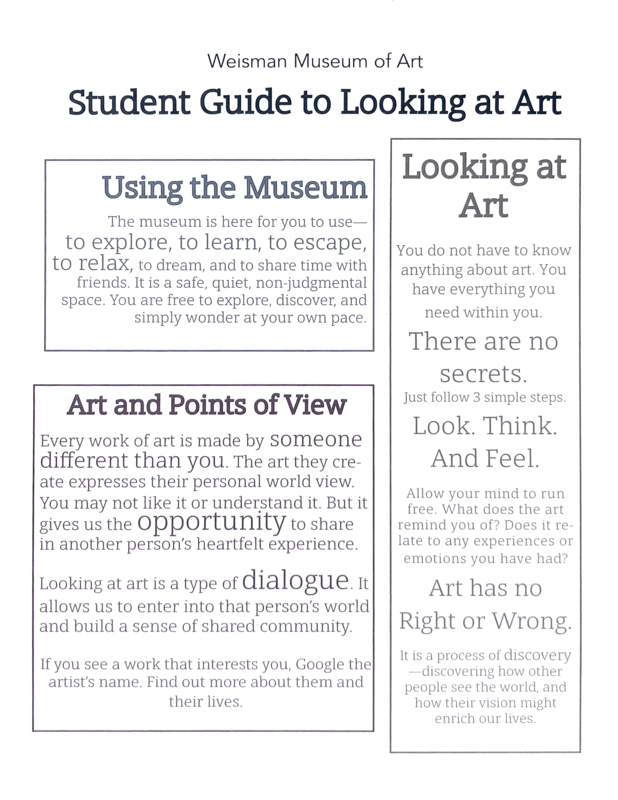 The Weisman has a one-sheet guide to looking at art at the front desk of the museum with a series of guided exercises, including slow and fast “looking” games in which students are encouraged to look at a work of art for 30 seconds to one minute, or five to 10 minutes, respectively. 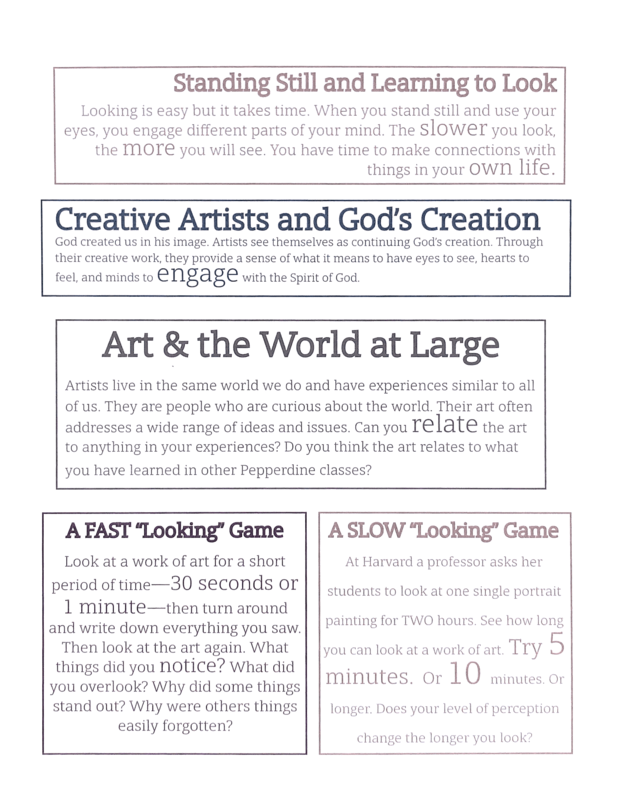 The exercises are abridged versions of those done by Harvard Art History Professor Jennifer Roberts who has her students write a research paper about a single work of art. For instance, she writes that if a student wanted to look at “A Boy with a Flying Squirrel,” a colonial portrait by John Singleton Copley, they would have to go to the Museum of Fine Arts, Boston and look at the painting for three hours. The painting by this renowned portraitist pictures his stepbrother Henry Pelham and a tiny rodent and is known as a demonstration piece, showcasing the artist’s talent by depicting a series of complex artistic maneuvers — a small painted gold chain, a varnished table and water in a glass. The painting certainly provides fertile ground for an in-depth visual reading — one that perhaps has the potential to take three hours (the ruddy complexion of Pelham and the red curtains in the background are all-enveloping). But how exactly does this relate to wellness? Looking within can indeed have the potential for healing, which is precisely what the new initiative strives to do by slowing down the frantic pace in which we govern our lives and creating a slower frame of mind. Zakian recalled an experience when he engaged in close and slow looking at a work of art while he was an undergraduate at Columbia interning at the Hirshhorn Museum in Washington D.C. and visited the nearby Smithsonian American Art Museum. Greeted by a painting by abstract expressionist Milton Resnick — a series of swirls and loops of color in a field, a sort of abstracted version of Monet’s “Water Lilies” — he soon found himself standing still in front of the painting for 20 minutes. In addition to cultivating a sense of stillness and introspection, Zakian said the new initiative strives to make museums a place for connection and dialogue among students, thus fostering a sense of community. Zakian added that when he spoke to Horton about the initiative, she said many students who visit the Counseling Center feel a sense of isolation despite having roommates and friends. 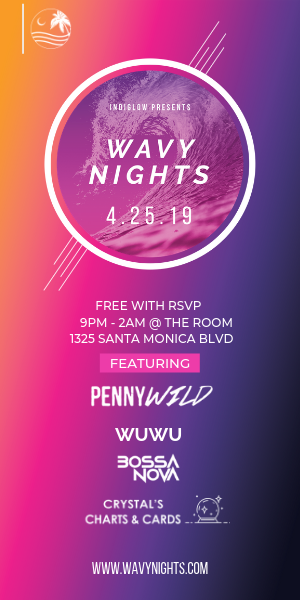 This points toward a lack of emotional connection that could be partially remedied by dialogue about works that represent different points of view and urge the viewers to converse with one another. Shows like the Weisman’s Pop! exhibition this past fall are conducive to representing a variety of points of view from different artists in which students can engage in dialogue. 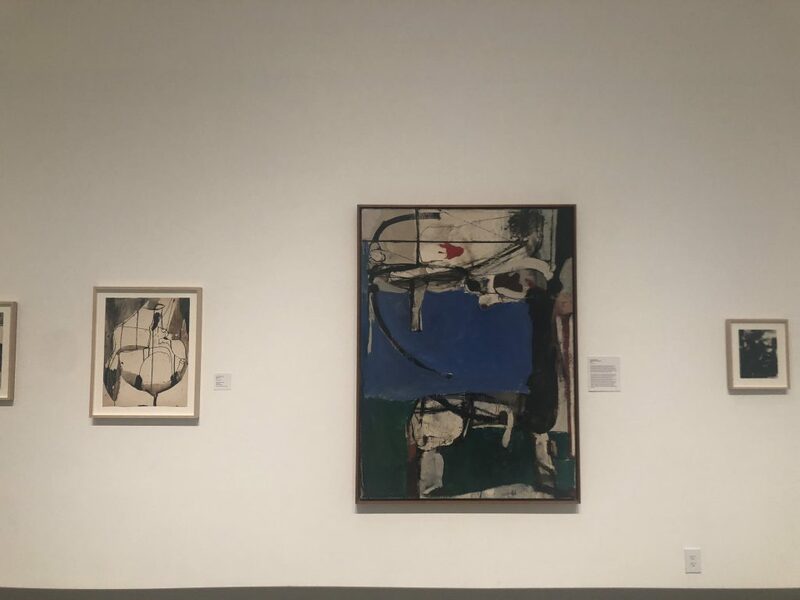 Zakian acknowledged the difficulty of single-artist shows — like the current Richard Diebenkorn exhibition — in creating meaningful discourse in which students can participate. In today’s age, moments of stillness are punctuated by scrolling through Instagram, quickly, sometimes absentmindedly. Discussion of Instagram and digital culture might seem to devolve into a harangue against today’s youth, but there is a certain validity to how Zakian describes the way we consume visual culture. Beyond fostering a sense of slowness and conversation with one another, museums provide us with insight into people and civilizations across time, Zakian said. Few may have a small flying pet squirrel on a gold chain coyly nibbling on a nut as in Copley’s portrait, but we can still discuss, learn, reflect and admire such works. Despite tinted windows, the Weisman Museum is open, and with the new initiative, it encourages students to slow down and think deeply to begin whatever process of healing is needed in their lives.